Marco and I are extremely pleased to announce that our new edited volume was published yesterday. 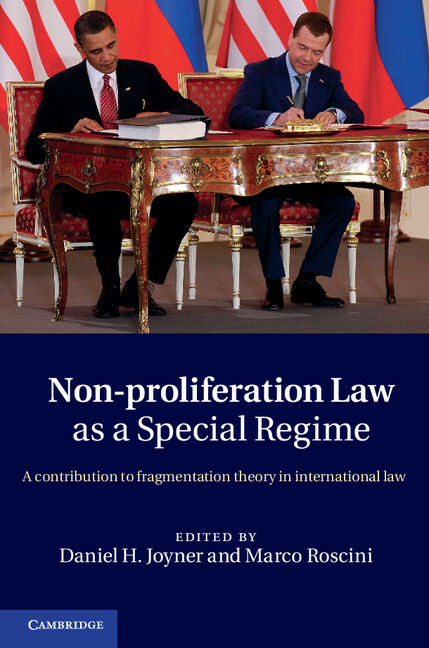 The book is entitled Nonproliferation Law as a Special Regime: A Contribution to Fragmentation Theory in International Law, and is published by Cambridge University Press. Here’s the link to the book on CUP’s website. At the site you’ll find some nice pdf excerpts from the book. I remember sitting with Marco in a patisserie in London in December 2009. Marco brought up an idea. He said he had been thinking about the body of nonproliferation treaties and related organizations, and whether, and to what extent, this issue specific area of international law might be usefully examined by reference to fragmentation theory, as a special regime of international law with specialized secondary rules. At the time, I had recently finished co-editing a book, which had been my second edited book. I can tell you from those two prior experiences that I had absolutely no inclination to embark on another edited book project. So, so many reasons for that feeling that I can explain some other time. But when I heard this idea, it just made so much sense to me, and seemed so substantively interesting and full of promise, that my reticence was overcome and I thought we just had to do one on this topic. We did talk about co-authoring the book, but we wanted this to be a real collective endeavor among a group of first class international lawyers, so that the results of the study would be less susceptible to criticism as just the argument of two nonproliferation law specialists. We were extremely fortunate that exactly such a group of contributors agreed to participate in the project. And we told the chapter authors from the beginning that we wanted each of them to conduct an independent inquiry in their agreed area of secondary rules, relating either to the law of state responsibility or to the law of treaties, into whether and to what extent there existed in the law and legal practice related to non-proliferation treaties, specific and specialized secondary rules that differed from the general rules of international law on that topic, and/or from specialized rules on that topic found in other substantive areas of international law. To the extent that such specialized rules were found to exist, the author’s second task was to consider whether these specialized rules could be considered as evidence supporting the conclusion that non-proliferation law is a special regime, at least as to that particular topic, explainable by fragmentation and special regime theory. So yes, this is a very theoretical book, and I know it won’t appeal to many outside of academia, but we do hope that the results and the methodology of the study will be seen as significant contributions to fragmentation theory scholarship, and to understanding of nonproliferation treaties and their specialized rules. Marco and I would like to thank the chapter authors for their excellent work on the book. They include Malgosia Fitzmaurice, Panos Merkouris, Andrew Michie, Matthew Happold, Nigel White, Eric Myjer, Jonathan Herbach, Dieter Fleck, and Sahib Singh. Fragmentation of international law has become a favorite topic in the literature, all too often dealt with in the same worn, tired way, referring to the same few cases and usually ending up with authors making more or less solemn over-generalizations in one direction or the other. Against this background, it is a true pleasure to follow a group of experts both on non-proliferation law and the relevant international law around the Non-Proliferation Treaty on their analysis of the ways in which this treaty regime is “special” without, however, essentially detaching itself from the general law in which it remains embedded. The book thus sets an admirable example of how the ever-increasing number of specialized treaty regimes ought to be subjected to a profound dialogue between experts in the respective subject areas and international law generalists to the profit of both. We can’t thank Judge Simma enough for those kind words, which compliment the book in precisely the ways in which we hoped it would make a significant contribution. Excellent news! Congratulations. I am eager to read it.